Welcome to "A Mountain Escape," an affordable 2 bedroom cabin in the Smoky Mountains that's close to Dollywood, Gatlinburg, and Pigeon Forge! 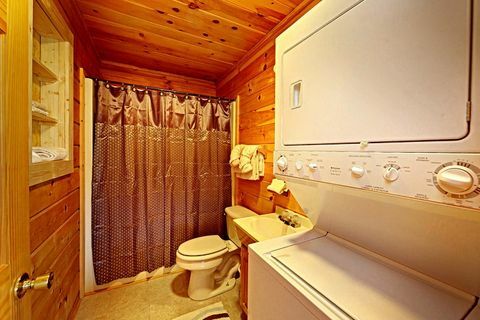 With a beautiful spot in the Upper Middle Creek road area, your log cabin in the mountains is ideal for making the most of your family vacation! 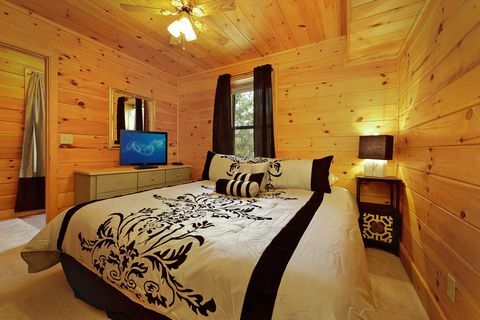 This two bedroom cabin near Pigeon Forge offers sleeping space for 6 guests. With a king suite, a queen suite, and an additional sleeper sofa, there's plenty of room for a small family vacation or gathering of friends. 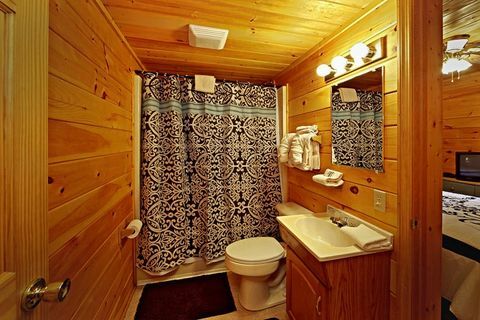 Your affordable cabin rental near Dollywood comes complete with a host of amenities for relaxing in your comfortable vacation retreat. Play a round of billiards for some rousing competition with family and friends. Enjoy the fresh mountain breeze from your cabin's covered deck. 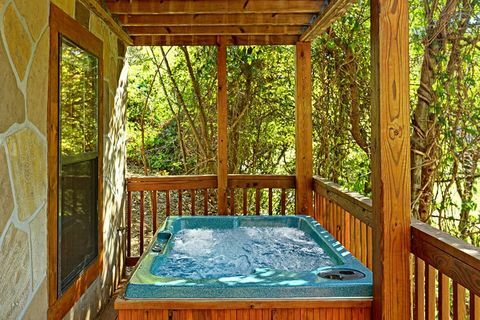 Sit back in the hot tub and let your stress evaporate in the steamy waters. 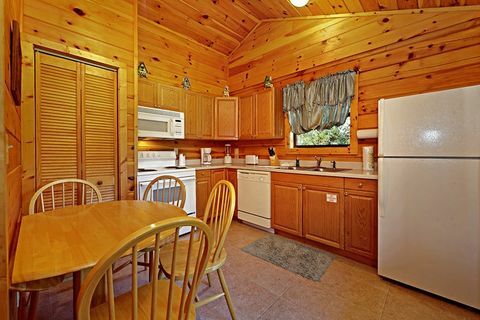 Although your cabin is close to great restaurants on the Pigeon Forge Parkway, your cabin with a kitchen and barbecue grill gives your family the option to cook their own meals just the way they like! 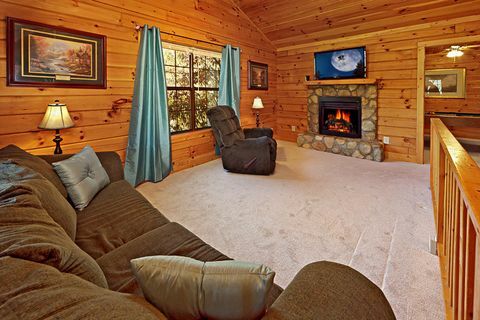 Other conveniences like Internet access and the seasonal fireplace will have you feeling right at home in the Smokies! While you can enjoy all the benefits of a restful stay in your cabin, your family can easily take advantage of their rental's great location near the top attractions. Be first in line at Dollywood for excellent roller coasters. Set out for adventurous hikes in the Great Smoky Mountains National Park! Drive scenic back roads to Gatlinburg, TN for an afternoon of shopping and walking in the beautiful downtown area. Visit Ober Gatlinburg for a day of Smoky Mountain skiing! 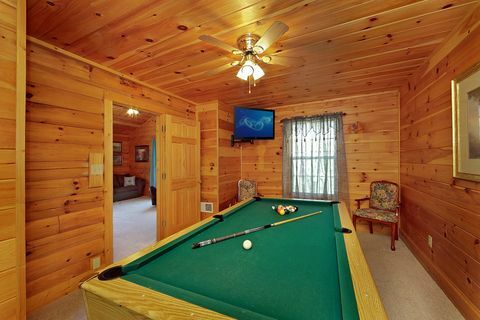 You can ensure that the possibilities for family fun in the Smokies are endless by booking a quality cabin in the Smokies! Stay well rested for days of fun while also staying close to everything that makes the Smoky Mountains a top vacation destination. 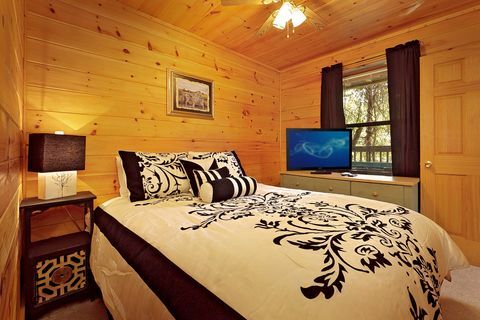 Your cabin near Dollywood in Pigeon Forge sleeps up to 6 guests, but there are several nearby cabins that can be booked together to accommodate larger groups. Some of our properties within walking distance of "A Mountain Escape" include "A Peaceful Getaway," A Romantic Retreat," and "A Smoky Hideaway." If you'd like to book 2 or more cabins, please contact our reservations staff to arrange a fantastic group vacation! On top of a prime location and relaxing amenities, you can enjoy a cabin vacation that's supremely affordable thanks to our special discount. 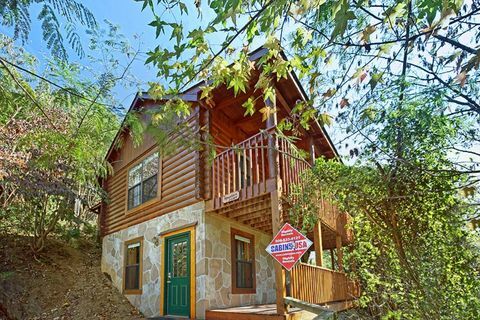 Save 15% on your vacation cabin in the Great Smoky Mountains when you book online with Cabins USA Gatlinburg!